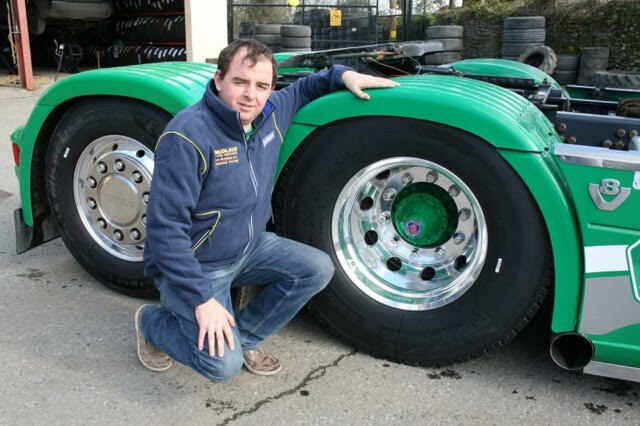 Fethard, County Tipperary based owner-driver haulier Daìre Maher has switched to Michelin’s X-Multi range of tyres on his Scania R560 tractor-unit after costly fuel bills prompted him to remove a competitor set with 13mm tread remaining. 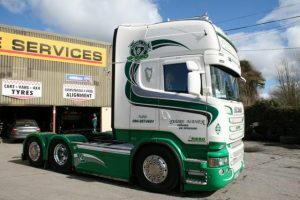 Midland Tyre Services, a Michelin Service Pro dealer, worked closely with Daìre and his Michelin Account Manager Trevor Burns to find a solution that would provide long-term fuel efficiency and longevity on the road. Bespoke tyre pressures were suggested following a weighing exercise carried out by Trevor and his Michelin Technical Manager. Transporting heavy bulk and construction haulage work in Ireland and occasionally the UK, Daìre Maher Haulage covers up to 130,000 km a year.